As you may recall, late last year I bared my soul and revealed that I don't own a glue gun. My comprehensive organizational efforts eventually dwindled down to more of a micro-organization in which I managed to incorporate a little sewing + hot gluing project too. 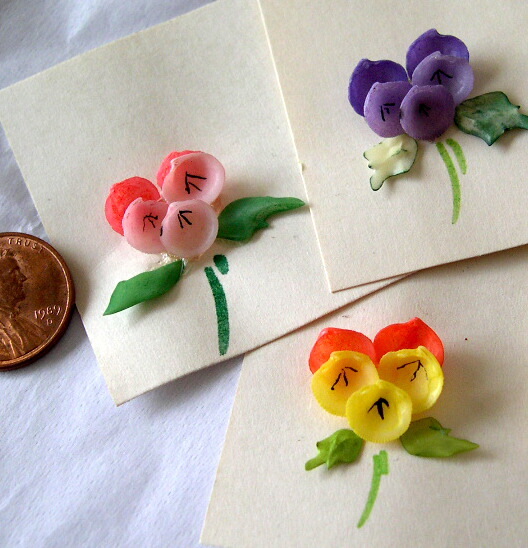 This photo is unrelated to this post but I found these little hand-painted shell pansy cards yesterday while out thrifting and this seemed as good a time as any to share. For someone who sews, I am sorely lacking in the pincushion department and that can get downright hazardous as I use some very large and somewhat dull needles for my etsy shop packaging. I'm constantly dropping them and they quietly roll away, biding their time until they decide to reappear somewhere ... unexpected. Now those needles have a home of their own. 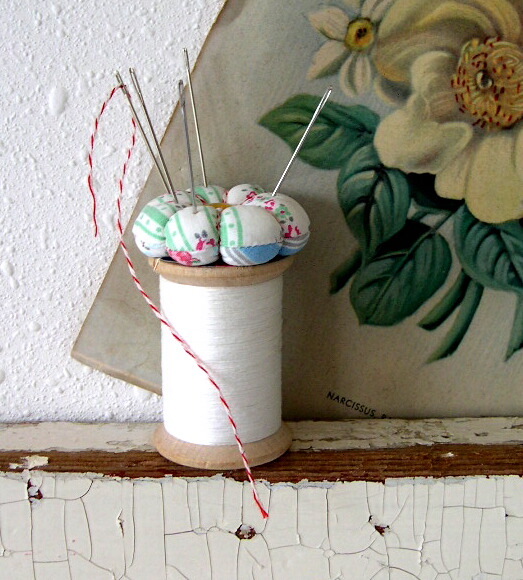 I made the world's tiniest pincushion (tutorial here), added a teeny vintage mother-of-pearl button and hot-glued the whole thing to a vintage spool of thread. Hope 2011 is going smoothly for you so far. but then, everything you make is wonderful! That little cusion is too cute. I don't sew, so the idea of making something that small is overwhelming. Good use of the glue gun, too. That is SO cute!! Thanks for the tutorial! OMWord! That lil' cutie can stand on your machine on the spare post, if you have one. Isn't that the cutest thing?! That pincushion is sweet! I have something similar that I purchased and it is glued on top of a golf tee so you can just slip it into whatever spool of thread you happen to be using at the time. Your pincusion is a more vintage style that I far prefer. Nice job! i cant count how many times I have stepped on a stray pin! (and I have pin cushions up the ying yang!) yours btw super cute! Love That! Who says BIGGER is better??!! No way, Tiny Pincushions Rule!! Thanks for sharing!~ Looking forward to more of your creations in 2011!! That really is a wee little pincushion! And obviously very much needed in the doily factory. I'm always losing my needles, and I've actually had a nightmare about one ending up in my thigh, with just the thread showing. That was probably TMI, wasn't it? Anyway, very cute pincushion! 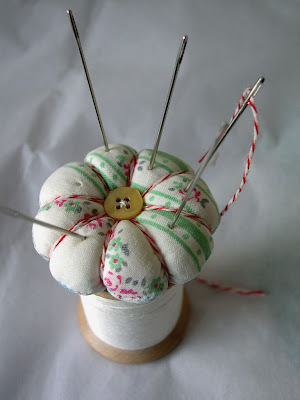 Mini pincushion -- very sweet. Sa-weet! Yeah, sounded like you needed a pincushion. Needles in feet= not a good mental picture! I love those little cards, as well. this post is so full of sweet images! adorable pin cushion. This is just about the cutest thing I've seen! That would come in handy for any quilter/sewer/crafter person. I'll have to take a look at that. Oh, and by the way, I recall having a glue gun too, very seldom used. I wonder where it is? That is just the cutest thing! Although I have a pincushion for pins, I could really use a separate one just for needles. I am always losing those little suckers. 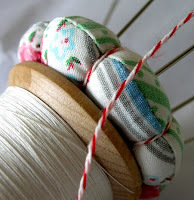 love love love the pincusion--my husband is the needle loser in our house-we practically have to wear shoes to be safe! If that's not the cutest thing ever, Amy. Darling. I'm a fan of the magnetic pincushion as it allows me to just kind of toss my pin in the general direction of the "cushion" and some form of scientific phenomena takes it from there. so super cute. love it! !